It was only when Pesi Unwalla of MediaPower New Media Communications wowed us with a very impressive presentation last Thursday, that we truly realized how crucial it was to take a serious look at using streaming video on our websites. 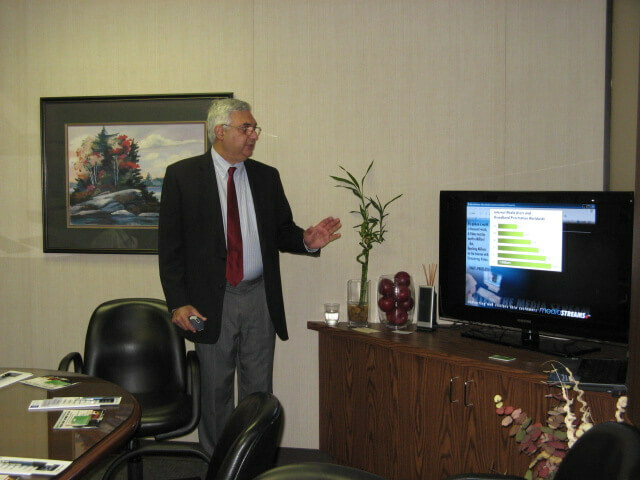 – It gives your message credibility because you speak directly to your viewer, with full eye contact. 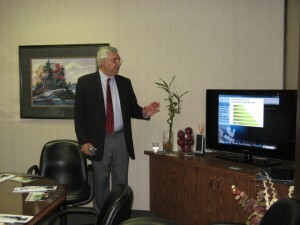 -But most importantly, he proved that we could improve our “Conversion factor” by over 140% just by using web video! As he explained it, Conversion means “the number of casual viewers that are converted into actual customers” – something that can make or break your online business. Walk-on Video – shown on home page, grabs attention because it is different when your spokesperson actually walks out onto the web page in front of the content, delivers the message in a minute or so and then walks out again. This is the perfect example of a marketing tool that is not only effective at communication but will also set a website well above the competition. If you would like to see a working demonstration of a Walk-on Video on YOUR OWN website – just take a stroll over to www.mediastreams.ca/walkondemo/ and you can plug your own web address into the form on that page and it will show you what a Walk-on Video looks like on your very own site! Talking Head Video – used on a home page for marketing purposes to engage the viewer with eye contact to emphasize benefits and the uniqueness of using your products or services. Web Banner Videos – also used on a home page to engage the viewer with your USP (unique selling proposition); can be a “talking head” or photo images. Testimonial Videos – typically used on other pages on the site (not home page); adds credibility and is more believable than mere words that a viewer may or may not read; a video is more likely to be viewed. Mini Executive Profile Videos – ie. mini-videos, not mini-executives! These short videos are best used on the “About Us” page of a website to give the viewers a personal connection with the Owner or Key Person’s philosophy on the company, its product and/or people; establishes greater credibility. Web Video Commercial / “Web-fomercials” – enables a company to go into greater detail to provide more information on the company, product or service; a link can be provided on the home page or another page inviting the viewer to click on the link for a “product demo” for instance. The Information Video – a prepared information video may be uploaded to Youtube and other web-sharing sites; using metatags in the video, this is a powerful took in driving traffic to your website and providing tremendous value to your online audience. Pesi showed us that it doesn’t have to be expensive to add streaming video, with some packages starting at less than $400! That certainly got our attention as other companies quoted $5,000 as their starting point! 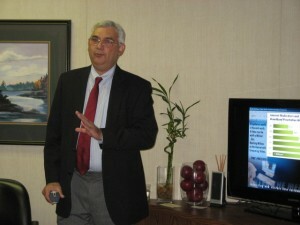 (He had a special offer for attendees for incorporating a PowerPoint presentation onto their sites). As a follow-up to his talk, Pesi also offered to send everyone a copy of an eReport on how streaming video has been proven to provide 144% higher conversations. Now that’s an impressive statistic! Let us know if you also would like a copy of this report which can be emailed to you. Take a moment to try out a demo of a Walk-on Video on your own website by visiting www.mediastreams.ca/walkondemo/ – it’s an eye opener and it’s fun!